Please show up 5 minutes before your appointment. This facial is customized to the individual's skin type. After the esthetician analyzes the skin, the client enjoys multiple treatments including a double cleansing, steam, massage, toner, exfoliation, and hydration. 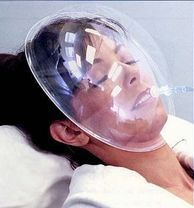 A masque may also be used based on the client's needs. This treatment will leave you with refreshing soft skin. Our clients "on the go" will enjoy a mini version of our signature facial which includes a skin analysis, massage, steam, exfoliation, toner, and hydration. This rejuvenating facial uses only natural and organic products. Vitamins and minerals from our plant extract and anti-inflammatory mask will leave you with a refreshing new look. This session will also include a cucumber eye soak and lavender/chamomile foot scrub. This spicy mask will nourish the skin with antioxidants as it's packed with Vitamins A and C. This Pumpkin-Orange enzyme will exfoliate and reduce oil while you enjoy the wonderful smell of pumpkin and orange. The perfect mask for fall! Ginger, vanilla, and cloves create an aromatic facial which will relax both the body and the senses. Prepare for a warming sensation with these spices, and also the expectation of pore refinement and soft/exfoliated skin. The perfect anti-aging, antioxidant facial for warming up the body while the temperatures are dropping outside! Oxygen facial is designed to soften, brighten, and balance out the skin. This relaxing treatment helps firm and improve skin’s suppleness, hydrate and revitalize skin, improve circulation, reduce acne and scarring, plump skin, minimizes fine lines, reduce pore size, and reduce pigmentation. Our Oxygen Facial, also known as the “Natural Botox,” is widely used by celebrities. This customized facial delivers a mixture of hyperbaric oxygen and anti-serums through an airbrush wand. The oxygen alleviates wrinkles and lines by allowing moisture, vitamins, and minerals to enter the skin. This device also repairs skin that is damaged by harmful pollutants. Because you get immediate results, this facial is perfect for any holiday or special event. There are no refunds on any services or packages.